4. "Urlicht". Sehr feierlich, aber schlicht "O Röschen rot!" 4. Sehr langsam. Misterioso ppp - "O Mensch! 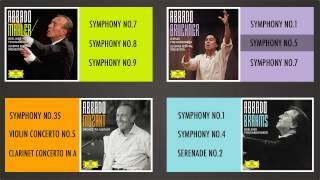 Gib acht"
In tribute to Claudio Abbado's recent death on 20th January 2014, DG is delighted to release four mini boxes drawn from the extraordinary 41CD Symphony Edition -- dedicated to Brahms, Bruckner, Mahler and Mozart.